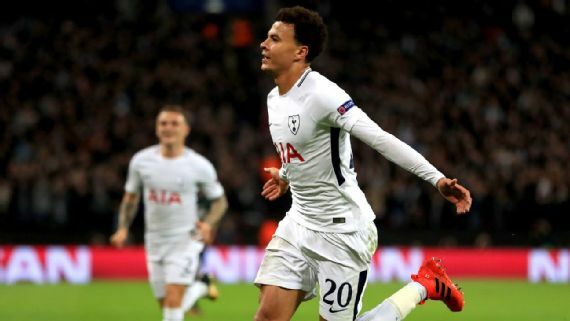 He has had to wait for his chance to shine on the Champions League stage this season, but Dele Alli delivered for Tottenham when it mattered the most, with a two-goal display to inspire Mauricio Pochettino’s team to a famous Wembley victory against Real Madrid. Real, the reigning European champions, were undone and outplayed, with Pochettino outsmarting Zinedine Zidane tactically in this Group H clash. But it was ultimately Alli’s contribution that proved the difference between the two teams, with the England midfielder producing his best European performance for Spurs after returning from a three-game UEFA suspension. The 21-year-old opened the scoring on 27 minutes when he raced into the 6-yard box to guide Kieran Trippier’s cross into the net having beaten Real defender Nacho to the ball. Alli then made it 2-0 early in the second half when his run into Real territory ended with his shot deflecting into the net off the back of Sergio Ramos. In front of watching England manager Gareth Southgate, Alli was also able to keep his suspect temperament in check against Real, with the former MK Dons youngster letting his football to do the talking. All in all, it was a performance that will do little to dampen speculation linking him with a move to Real, with Harry Kane showing the Spanish giants that he can deliver on the big stage with another impressive performance. Kane was unable to score on his return from a hamstring injury, but his composed layoff to Christian Eriksen on 65 minutes teed up Tottenham’s third goal for the Denmark midfielder and secured the victory long before Cristiano Ronaldo pulled one back for Real. Wednesday’s victory moves Spurs three points clear of Real at the top of Group H ahead of their final games against Borussia Dortmund and APOEL Nicosia. Trippier has not found this season as straightforward as he might have imagined after seeing off the challenge of Kyle Walker at Tottenham. With Walker sold to Manchester City having lost his place to the former Burnley right-back, Trippier looked to have had the right-back slot nailed down until Pochettino snapped up Serge Aurier from Paris Saint-Germain. Aurier has phased Trippier out of the team and was chosen to start the 1-0 defeat at Manchester United last weekend, but his erratic performance at Old Trafford opened the door for Trippier to return to the starting lineup against Real, and he grasped his opportunity in impressive style. Trippier’s biggest asset is his ability to produce dangerous crosses from the right, something that can outweigh the defensive deficiencies in his game. Against Real, Trippier not only provided a threat down the right — his cross led to Alli’s opener — but also proved he could defend against a quality opponent. He was dogged and disciplined, with Isco usually his opposite man; he kept the Spain midfielder quiet on a night when Real were unusually out of sorts. Aurier might have more top-level pedigree than Trippier from his time at PSG, but on the evidence of the past two games, it is the England defender who should be starting regularly at right-back. Real Madrid’s aura of invincibility in the Champions League was shattered at Wembley, as Spurs dominated for 90 minutes and deservedly won to claim top spot in Group H. It was Real’s first group stage defeat since October 2012, a run of 30 games, and arguably their most humiliating defeat since losing 4-0 against Liverpool at Anfield in March 2009. As the television cameras focused on crying Real fans and the stony-faced expression of president Florentino Perez in the directors box, it was clear that this was a painful experience for the kings of Europe. Nothing is worse than when opposition fans began to chant “ole” to mock the opposition, but Real were so bad that they had to endure that torment. Despite the big defeat, this is still Real Madrid, the 12-time European champions and first team to win the Champions League in successive seasons. One can expect there will be a response at some stage. They might have made a dismal start to the season — Wednesday saw their third defeat in 11 games — but big teams and big players tend to bounce back when they have been embarrassed. Real have too much quality for that not to happen, but they will no longer be feared by opponents in the Champions League after this. For now at least, they’re back with the mere mortals, and every team left in the competition in the knockout stages will face Real with a newfound sense of belief.